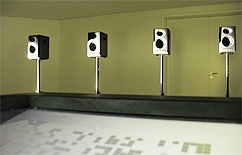 A room with eight speakers forming a dotted line. 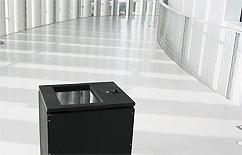 The visitor in front of a terminal, a black monolith, a focus point, equipped with a trackpad and a screen. The visitor placing elements on a grid, placing squares on a screen, shaping a virtual space transformed into an audible space, transmitted via the internet to define the same space again at a different space, at a different physical location. Parallel worlds. On the screen a matrix of 15 horizontal blocks of 32 squares is displayed. The 32 squares of each row are scanned by a travelling dot. The horizontal position maps events to one of the eight speakers. The visitor can click on each square and mark it. Marking a square on screen means marking a space in the room. The travelling dot hits the space on the screen, creates a sound in the room. The moving dot plus the marked square creates patterns in space and patterns in time. Movement equals time. Movement plus space manifests rhythm. Time equals space. Each row creates a different sound. Marking different squares in different rows creates layers of sounds. The movements of the travelling dots can also be modified. The resulting patterns of sounds in space get more and more complex. The more marks are drawn on screen the more dense and potentially chaotic the rhythm gets. The installation exists simultaneously in two physical locations. Both spaces are linked. The virtual space defined on the screen appears on both terminals and can be modified at the same time by two people. In both locations the same actions result in the same sonic experience. The internet acts as the wormhole. Two spaces are mapped to each other. Data travels faster than sound allowing two physical locations to merge into one virtual space. Each location is the exact mirror of the other one. The installation encourages visitors to interact, to create spaces and rhythm together with an invisible counterpart somewhere else. The presence of the other side of the world is indicated by a clock telling since when the last visitor is playing with the installation. Each side is made aware of the existence of the other side. Interaction follows simple social principles. One person creates, the other is observing, destroying, overwriting, interacting, contributing, playing with or against each other. Actions from both terminals have different colors on screen. The presence of the other side: an invasion of a new color. Is the other side a human being or a machine? The answer becomes obvious after playing for a short while. 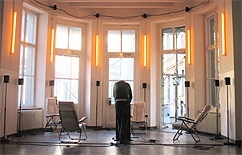 The installation becomes a social laboratory. Is the other side helping to build up an interesting sonic structure, is it willing to collaborate or just invading the space, deleting all your contributions, filling up all space with its own color? The empty grid wants to be filled. The warm background sounds created by the machine during idle times gets lower and lower the more spaces on the grid are marked. The rhythm gets more dense and louder. The space is filled with sounds, like building a random city of buildings. After a while this gets boring. People start to delete marks again, finding more interesting structures, opening up spaces again, discovering that emptiness is a value. that interactions get more powerful if the structure is simple and elegant. The chaos vanishes, the results become musical. On the top left side of the screen a simple message : click here to make it louder. People press it. 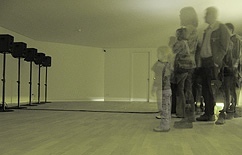 The space becomes more physical, the sound now completely fills the room, touching the visitor. How appealing to create chaos once again. Children are the first ones to discover what a large number of marks plus volume can do. They love it. Once the installation becomes a raging machine they leave. Satisfied. If no one plays for a while on both sides, the installation calms down. It deletes all marks step by step and gets more quiet. The background atmospheres come back. After five minutes of no interaction the installation presents an empty space again. Just the atmosphere indicates it is alive and waits for future interaction. Linear Grid has been created by Robert Henke 2007, based on the Atlantic Waves engine (2002 - 2007). The installation is a commissioned work of TESLA Berlin with Philharmonie Luxembourg and the Museum of Modern Art (MUDAM) Luxembourg. 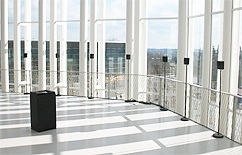 The installation connects the Philharmonie Luxembourg with the MUDAM as part of the festival musique visuelle from March 23 2007 till April 1 2007. It connects the MUDAM Luxembourg with TESLA Berlin from April 4 2007 till May 7 2007. 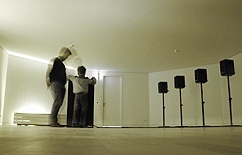 The following people have been significantly involved in the realisation and local setup of the installation at MUDAM and Philharomine Luxembourg and TESLA Berlin: Carsten Seiffarth, Martin Schmitz, Ecki Guether, Sam Wirtz, Carlo Schoup, Goetz Dihlmann, Bernhard Guenther, Anna Loporcaro, Folkmar Hein, Peter Baumeister. Thank you!